Note: this review was written in February, 2011. In June, 2012, the club announced it would not offer downhill skiing or snowboarding for the 2012-2013 season. (“Otsego Club won’t open slopes this winter, PetoskyNews.com, June 1, 2012) After some uncertainty and negotiations, the club’s winter business returned, though without an emphasis on attracting Olympic athletes. (“Otsego Club and Resort bounces back,” DBusiness.com, January 16, 2014) Said the new manager of the previous management: “They built an Olympic-size half-pipe, and it was beautiful. The problem was the core membership of the club couldn’t access it (because it was built for professionals).” The original review follows. If you were going to train for the Winter Olympics or Winter X Games, where would you go? Colorado, the home of the U.S. Olympic Committee? Utah, which hosted the 2002 Olympics game? Or perhaps Lake Placid, New York, home of the 1980 Olympics? Michigan? Yes. The state that is known more for a crumbling city (Detroit) or perhaps the Great Lakes than for great mountains is home to the Otsego Club, in the northern Lower Peninsula. The club, which claims to be “America’s oldest private ski club with its own facility,” was founded in 1939 by a steel magnate, then owned by a top lawyer for Ford. Today this old-money club is vigorously embracing the world of freestyle snowboarding. While membership has its benefits, anyone can stay in one of the lodges and use the grounds for cross-country skiing or snowshoeing. (Eight miles of cross-country trails wander through the property, though snowshoeing actually gets more traffic.) You can also, on a limited basis, ride or ski if you’re not a member. In the summer, anyone willing to pay the greens fees can play golf at the two golf courses on site. Despite the impression of opulence that the term “private club” may give, Otsego lacks some of the facilities that you might expect. There’s no spa, for example, and the fitness room is sparse, with only a few pieces of aerobic equipment. There’s a pool onsite, too, but only outdoors. As a result, some public resorts in the state (Boyne Mountain is the most notable example) have a more luxurious feel. A marketing brochure says there are 32 slopes, and the map shows 26 named slopes. Customers are served by 5 chair lifts, including a quad, and a tow rope. It’s easy to move between chairs 1, 2, and 3, since they are all at the bottom of the front bowl. It’s easy to move between the front three and the back two lifts. The slopes are intermediate in difficulty for the Midwest, with only two (Beanie’s Bummer and Wayne’s Racing Hill) offering serious steepness from top to bottom. (Both are narrow as well.) There were no moguls when I visited. The lack of extreme terrain doesn’t mean you can’t have fun; an intermediate level serves many people just fine. In addition to the groomed slopes, there are also five small glades, which offer the opportunity to catch some powder. If you’re there after some good snowfall, make a hard left shortly you exist the top of chair 3 and you may find an unmarked slope that offers the opportunity to enjoy more powder. Snowboarders beware, however: The hill empties out to a road that may some skating if you don’t approach it with speed. The “new thing” at the club is obvious when you walk outside the back of the main lodge: The bowl (which is actually fairly flat) is given over to freestyle terrain features. (If you want to cruise, you can easily avoid the features and proceed to the back two lifts.) The “O Park“ has 50 rails of various types, plus other “jibable” objects such as a picnic table, a barrel, and a wall set into the ground at roughly 70 degrees. There are also a number of jumps and rollers, but the feature that draws the most attraction is the 22-foot halfpipe, the only one of its size in the eastern U.S., and one of five in the United States. The pipe has drawn the attention of several Olympic snowboarding teams, including, most recently, the U.S. team. Not only is the halfpipe the right size for training, it is served by a short ride up a chairlift. If you’re interested in getting in a lot of practice on a halfpipe, short is beautiful, turning the short vertical drop of this Midwestern hill into an asset: Halfpipe users wanting to make laps don’t have to ride on a chairlift for a 2,000 foot-climb or walk back up the pipe. At the other end of the skills spectrum, a low-rise area at one end of the bowl gives novices the chance to start out riding on rails, fun boxes, and other features in a low-risk setting. If racing is your thing, there’s a NASTAR course available for $10, and the hill is home to various racing programs. You can also test yourself on a half-mile-long boardercross course that features racing gates and lots of rollers. 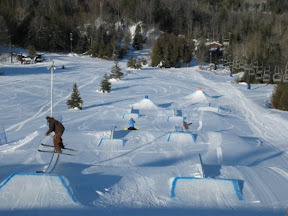 The club puts in banked turns when it hosts boardercross championships. For a more sedate way to travel on the snow, there’s also a spot for sledding. As is typical with Midwestern resorts, night skiing and riding is available, but two of the three lifts that run at night serve the bowl/halfpipe. The management says that the customer demand that does exist for night riding/skiing is found in the freestyle crowd. The most significant shortcoming of my trip came one day when lift 5 was stopped five or six times within two hours for troubleshooting. The club had recently done some maintenance work on the electrical system, but apparently had not worked out all the kinks. Once the lift was stopped for about 10 minutes, after which the crew had to resort to a regime of loading every other chair, for about 5 minutes. There are three locations to eat on site. The River Cabin, at the base of lift 4, is open only during the winter season, offering the food you’d normally expect on a ski hill. A large circular fireplace is the visual highlight of the cabin. Anyone in your family or group who prefers to stay in the lodge rather than ski or ride can meet you for lunch by taking a free ride on a 1940s snowcat, now equipped with skis. The main lodge, which sites at the edge of the upside-down ski area, has two restaurants side by side. The Pontresina Steakhouse is the more exclusive spot. It holds only 40 people or so, and reservations are usually required. It has won awards from Wine Spectator, but my steak came drier than I expected. The grilled shrimp, however, was excellent. The Duck Blind Grille seats 100. It has soups and sandwiches, though it’s not simply a soup and sandwich place. Think of it as a slightly cheaper version of the Pontresina. My first meal there was a roast beef sandwich. It struck me as much too salty, though I haven’t had an au jus sandwich in a long time. My second meal was a “make your own pasta bowl” that lets you choose from a Chinese menu of pasta, sauce, and toppings. The server came back with the wrong kind of pasta, but eagerly sent it back when I pointed out the error and then suggested I would keep the dish anyway. The Grille is also the site of breakfasts, which are served buffet style, with a chef preparing omelets to order. There’s a good selection: scrambled eggs, oatmeal, bacon, sausage, fruits, breads, and cold cereals. The room can get chaotic on the weekends, as you might expect. Both restaurants have tables that face a portion of the ski slopes. While sitting at either restaurant, you can watch skiers and snowboarders glide along the lip of a small bowl before they disappeared down the hill. The views from the lodge extend into the Sturgeon River valley for up to 20 miles. When it comes to drinks, the Duck Blind Grille has a good selection of beer for a place that doesn’t specialize in it. You can also walk over to the Duck Blind Bar, which is housed in several honeycomb-like rooms (the ceilings slope down in spots). The Logmark, another watering hole, is closer to the lodging. It has about 40 seats, but can feel even smaller than it is due to a pool table that takes up a large chunk of floor space. Lodging on the site (117 rooms or suites) is dispersed into 6 different buildings, so you never feel like you’re part of a mammoth edifice. As a bonus, none of the buildings are that far from the slopes. If you come for the weekend, you can easily park your car and never get in a vehicle until you leave for home. The accommodations range from small rooms to small houses, giving visitors prices ranging from $69 to $482 per night. Members get either a 10 percent or a 20 percent discount off prices, depending on their membership level. The newest and most luxurious accommodations are in the Hilltop Lodge ($199-$349), a small building (8 rooms) which has a wonderfully charming commons area, with leather chairs, a fireplace, and chairs incorporating tree branches. The rooms come with either two double beds or a queen bed, a separate table and two chairs, and a kitchenette. The furniture in the building is a mix of arts-and-crafts and “northwoods” decor. Other buildings on the grounds lack common areas, though you can join several other families in tables set up in the hallways at the Tyrol lodge. The most interesting lodging may be found in The Loft, which as the name suggests, features lofts. Each room shares a key-coded outside entrance with another room. Some of the rooms on the grounds are owned by the club, while others are condo units owned by individuals and managed by the club as part of a rental pool. A few ski-in, ski-out detached condominiums are under construction. While the club has been around for 70 years, it came under new ownership in late 2006. A sorely needed makeover ensued; one member reports that “the previous ownership let things slide a bit,” a sentiment tacitly confirmed by the staff I talked with, as well as online comments from websites such as TripAdvisor.com. The new owners, who also own or manage several upscale golf courses in the state, have made major investments both on and off the slopes. The Hilltop Lodge was completed in 2008, raising the bar for lodging. The club also purchased new snowmaking equipment and two new groomers. The club’s owners and management saw an opportunity to distinguish the club by outdoing the other areas in the state (notably Boyne and Nub’s Nob) by ramping up its commitment to freestyle. The thinking: Draw attention to the club–and drive membership–by becoming the premier freestyle destination in the state, and keep home-grown talent from defecting to other resorts. In addition to developing the O-Park, the club promotes its freestyle side by taking an urban rail setup to events in the metro Detroit area. Has the financial investment paid off? Kris Klay, the club’s general manager, did not volunteer any numbers to substantiate a growth in membership or revenue, but he’s happy with the progress the club has made. Driver says the club’s commitment has brought financial benefits to the region, and that the club is in it for the long haul. What does the membership think of the financial outlay and the disruption of the well-known bowl that the installation of O-Park required? Driver concedes there have been some “growing pains,” but the members I talked with seemed to approve. The outside world has indeed noticed, showing that freestyle skiing and riding can give small resorts the chance to become big names. The breakthrough for the club came when it attracted the attention of Tom Willmott, coach of the New Zealand snowboarding team. He eventually took his squad there in preparation for the 2010 Vancouver Olympics. Willmott, in turn, spread the word within the competitive snowboarding community, resulting in other teams, including the U.S. team, coming for visits. Among competitors giving glowing praise to the club were skier Simon Dumont and snowboarder Louie Vito. Members of the club and the local community lapped up the opportunity to rub shoulders and get autographs from world-class athletes. As a result of the team visits, Driver says, “we came on the map.” The club has caught the attention of ESPN as well as numerous media outlets in the state. It also has hosted events of the USASA. an umbrella organization of competitive snowboarding. The most recent milestone was hosting one of six stops on the six-stop TransWorld TransAmamateur competition of snowboarders. Driver is working to host even bigger events, though. The need to embrace the freestyle world isn’t limited to a small resort in the vertically challenged Midwest. I heard managers at Sun Valley, Idaho, express similar concerns when I visited last March. They were tired of losing “their kids” (and of course, their families) to resorts that had better freestyle terrain. Both Sun Valley and the Otsego Club have a long history as the skiing mecca for old money–and both are feeling the need to recognize that the times are changing. There are several kinds of membership, including ski only, golf only, and ski and golf. A winter membership that gives you unlimited downhill and cross-country skiing costs $1,350 per person, $2,100 per couple or $2,650 for a family. If you’d like to try the club, try one of the “test drive” packages, or the occasional mid-week specials that, for $100, will give you one night’s stay and one day’s lift ticket for two people. On Thursdays and Fridays, anyone can buy a ticket and uses the club for downhill riding or skiing. But on the weekend, lift tickets are available only to members (whose annual fee includes unlimited downhill skiing) and their guests (who pay a daily fee). Non-senior adults currently pay $25 on Thursdays, $60 on Fridays-Sundays. Discounts are available for multi-day tickets, and there’s a Thursday-night-only ticket as well. A sign at the ticket counter, though, warns that weekend guests who pay a return visit must pay double the going rate. Clearly, membership has its advantages. Now the big question: Is membership in the club worth the cost? Let’s compare it to the cost of some well-known resorts that are also in northern Michigan. A season pass at Nub’s Nob for four members cost $2,223 (or $2,111 for those who bought before October 10.) At Shanty Creek, a two-adult, two-child season pass cost $1,185. Boyne Mountain/Boyne Highlands (two resorts about 40 miles from each other) offers, like the Otsego Club, a multi-tiered approach to season passes. A married couple with two teenaged children will pay $3,036 for a “gold” pass, which has no blackout dates. Treetops, a somewhat smaller area just a few miles away from the Otsego Club, offers a season pass for $955. As far as daily tickets go, a one-day ticket for a non-senior adult at Nub’s Nob is $49 on weekdays, $58 on weekends, and $62 on holidays. Comparable prices at Shanty Creek are $30, $50, and $58. At Boyne, a non-senior adult ticket is $50 during the week, $60 on the weekend, and $66 on holidays. If you want to ride or ski at night, you have to pay extra. At Treetops, a day ticket ranges from $30 to $52. At each location, you have to pay extra for a ticket that extends beyond 4 or 5pm. So is the cost of the club worth it? It costs less than the Boyne properties, though Boyne is a seven-day-a-week operation. It doesn’t have the most terrain or the largest vertical drop in the state, but then again, this is Michigan, so we’re not talking about the difference between, say, a 300-foot vertical and a 3,000 foot vertical. And the small membership base means you won’t have to wait in line nearly as long as you will at some of the more popular resorts in the state, and that’s worth something. Still, there’s no one answer the question, since there are many factors involved, many of which are based on personal preferences and how often you plan to visit. But if you’re in Michigan and are going to make frequent weekend trips to a slope anyway, it’s worth considering. Click the photo below for some more photos. Most though not all of my expenses at the club were paid for by the club, which despite that fact, had no editorial oversight in the preparation of this review.